Fall is here! And there are so many awesome events and festivals coming in with the cool autumn breeze! Here's a list of some of our favorite things to do around the city this weekend. Tonight there is a benefit for Liliana Bakhtiarti at the Casa Nova! Check out the event page for more info here. Liliana Bakhtiari is running for Atlanta City council, district 5. The benefit show includes music from local acts LONER, Pamela_and her sons, Sister Sai, and Gush. Show starts at 9 and a five dollar suggested donation to support Liliana's campaign. This event is BYOB. 368 Ponce is hosting Cool Winners, Feline Fingers, Pete Though and Casey Doran! Come through if you're looking for some experimental music, comedy and a short documentary, Quasi-Genuine, by Nico Giarrano. The event starts at 9 and is 5 dollars. 529 and the crew at Irrelevant Music have a bill tonight with Sound of Ceres & Breathers w/ Robert Schneider & Mannequin Lover. This show starts at 10 pm, it's 21+ and 8 dollars at the door. Lady Fest is back again, this year at 368 Ponce! Check out the full Ladyfest Atlanta 2017 line up here. There's a whole slew of talks, performances and workshops to insight critical dialogue about issues around gender and oppression. Attendance is free but there will be donations taken up for SONG (Southerners On New Ground). 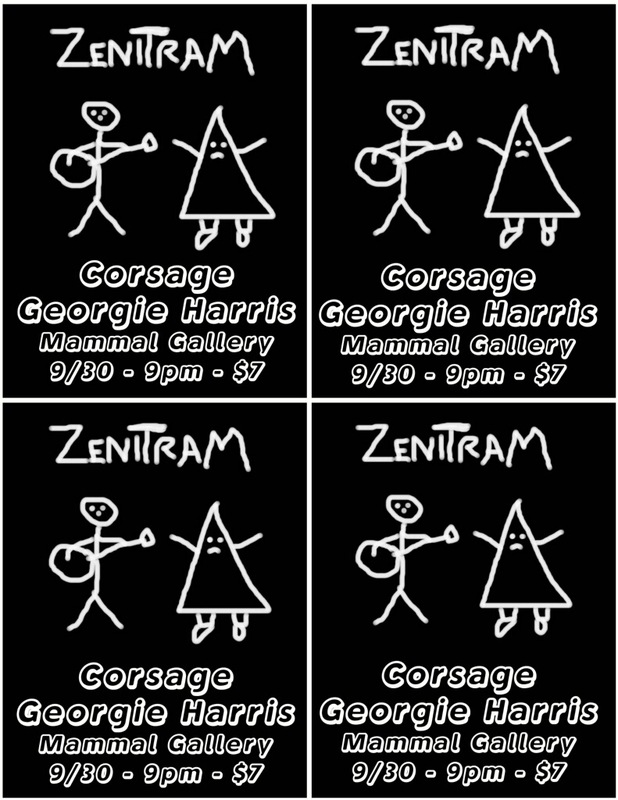 Mammal Gallery is hosting Zenitram Jr., TJ Allen Clinton, Georgie Harris and Corsage featuring Priscilla Smith. Full information and event page here. The doors open at 8pm, show starts 9pm and the cover is 7 dollars. Come dance with a giant slice of pizza! Sleeping Partner Studios is hosting a potluck with a couple of our favorite local acts! Full info and event page here. The line up consists of local acts Mothmanos, Eliot Eidelman, Sequoyah, DAD PRactice, Lebo Jenkins, Natalie Jane Hill, and Kebbie Williams Duo. Bring a dish and some beer to share. Dinner is at 7 but come earlier to rub elbows and help prepare food. Elmyr's 20th anniversary party and Grizz Olympics is going down Sunday to finish the weekend off right! Full event info and page here. Just in case you haven't drank enough already don't miss the 20th anniversary of one of Atlanta's truest gems, Elmyr. The party starts at 3pm and the Olympics at 6pm. Entry into the Grizz competition is only 20 bucks. There are only 32 spots open so show up early to get registered.